The light had been traveling a long time, oh, such a long time. It had passed gas clouds, tenuous patches of dust, interstellar and then even intergalactic space. It had blasted through countless atoms and unimaginable stretches of space and time, and now the light had been reduced to a mere echo of its once epic luminosity. But it was enough… after spending the age of the Universe careening through it, those few remaining photons finally saw something blocking their path that they couldn’t barrel their way through. And finally, after billions of years, in the early hours of Thursday, April 23, these electromagnetic bullets slammed into Swift’s gamma-ray detectors. And when they did, they signaled the detection of the most distant discrete object in the Universe ever seen. Gemini telescope detection of GRB 090423A. Gamma-ray burst GRB090423A, as it’s now called, not only breaks but completely destroys the previous record holder. In astronomical parlance, it has a redshift of 8.2, meaning the light from this burst has been traveling for more than 13 billion years! The previous most distant GRB was seen only just last September, but this new one is nearly 200 million light years farther away. Wow. Not too long ago, the most distant objects we had seen and been able to measure were quasars, galaxies spewing out huge amounts of radiation. The record holders were at (what seems now to be measly) redshifts of 5 or 6, corresponding to 12 billion light years away or so. But then gamma-ray bursts came on the scene, and blew away those distances. Swift is a satellite designed to detect these distant blockbusters, and has recorded the fading light from over 30 GRBs so far this year, and several hundred since its launch in 2004. I worked on the education and public outreach for Swift for several years, and I remember very well when we bagged a redshift 7 burst, blowing away the previous record. It was around then that I started to suspect that we might actually see much farther ones, even out to a redshift of 10 (nearly 13.2 billion light years). 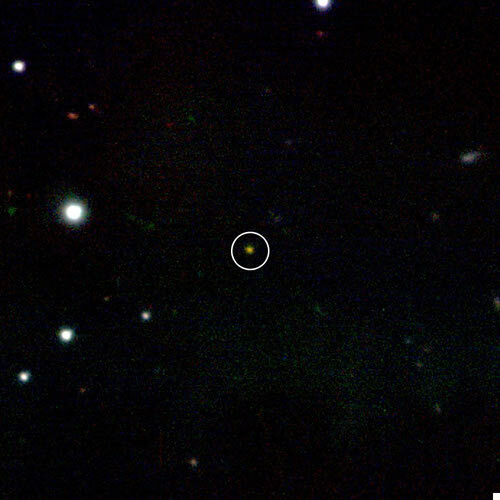 This detection of GRB 090423A indicates that’s no pipe dream. Artwork of a GRB at the moment of truth. A gamma-ray burst happens when a massive star – maybe as much as 100 times the mass of the Sun – explodes in a supernova. We’re not exactly sure why, even now, but the forces in the heart of this beast can focus the energy of the explosion into two beams of cosmic destruction; vast death rays blasting out from the core. The energies are beyond belief, dwarfing even the Sun’s total emitted energy over its entire lifetime. Any planet in that beam’s way within a few thousand light years of the burst is in for some serious hurt (which I lovingly detail in my book). But I doubt that happened for 090423A. When it went off, the Universe itself was only 630 million years old! There probably weren’t enough heavy elements to make earth-like planets, though I suppose gas giants might have been around by then… but even the first stars themselves were hardly more than 200 million years old at that time. It’s hard to imagine what the Universe must have looked like when it was so young. Finding such ancient gamma-ray bursts is crucial in understanding what the early cosmos was like. We can find out what proportion of elements existed in stars back then, and the way the light is absorbed by intervening dust and gas tells us about them as well. We know precious little from this era of the Universe, because any object in it was sp far away at the time that they are essentially invisible. Only the titanic brightness of a GRB allows us to see them at all. The star that exploded to form this GRB was probably not among the very first in the Universe to be born; even 230 million years is a long time compared to the lifetime of those extremely massive stars, which may have exploded after living only a million years or so. But it may have been born in the second generation, stars that formed from gas blown out by the explosions of those first stars. If so, we’re one step closer to seeing what the very first objects in the Universe were, and how they behaved. That’s a mystery that has been on the minds of many astronomers for many years, and Swift is whispering to us that we’re almost to the point where they are within our grasp. Image credits: Gemini Observatory/NSF/AURA, D. Fox and A. Cucchiara (Penn State Univ.) and E. Berger (Harvard Univ. ); and Dana Berry, Skyworks Digital.